Former U.N. Ambassador John Bolton knocked Obama’s "penchant for apologizing" on the world stage Friday as the president wrapped up the final leg of his Asia tour in Hiroshima. 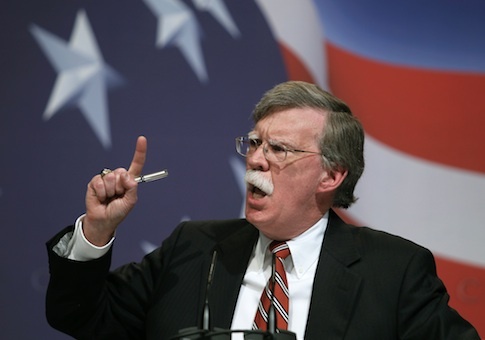 In a scathing op-ed published in the New York Post, Bolton predicted that Obama in Japan would "casually trash" former president Harry Truman’s "courageous decisions" to drop an atomic bomb on Hiroshima and Nagasaki to put an end to World War II. "Even without an express apology, there will likely be moral equivalence, like Japan bombed Pearl Harbor and we bombed Hiroshima. We’re all guilty, but let’s put it behind us," he wrote. "Undeniably, World War II is history, and further strengthening the U.S.-Japan alliance profoundly important. But there is no moral equivalence here." Obama on Friday became the first sitting president to visit Hiroshima, renewing appeals to rid the world of nuclear weapons without expressly apologizing for America’s past. "A flash of light and a wall of fire destroyed a city, and demonstrated that mankind possessed the means to destroy itself," Obama said in an address before meeting privately with bomb survivors. "We may not be able to eliminate man’s capacity to do evil, so nations and the alliances that we form must possess the means to defend ourselves. But among those nations like my own that hold nuclear stockpiles, we must have the courage to escape the logic of fear and pursue a world without them," he added. But Bolton said that the suggestion of regret implies that U.S. enemies are "morally equivalent" and magnifies Obama’s "shameful" tendency of "bowing to foreign leaders." "Obama’s narcissism, his zeal for photo opportunities with him at the center, whether in Havana or Hiroshima, too often overcomes lesser concerns—like the best interests of the country. He puts his vanity before our nation’s pride," Bolton wrote. "Truman understood that not using the atom bombs would have condemned millions of service members to death or debilitating injury…The calculus could not have been clearer." Obama’s trip to Asia was the tenth during his presidency. He will leave for Washington, D.C. Friday evening. This entry was posted in National Security and tagged Barack Obama, Hiroshima, John Bolton. Bookmark the permalink.